It’s been already almost seven months since my last post, and I have to admit that I am really ashamed of it. Another one from the infinite pool of people who don’t stand up to their promises, huh? 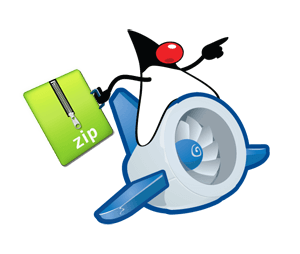 But enough of this, you’ve most likely came here to learn something about creating zip files in Google App Engine / Java servlets, and that’s what this post is (from now on) all about. So, let’s get started, shall we? I am going to explain what you need to access your web app’s static files and/or files stored in Blobstore in your servlet; how to pack these files using standard java.util.zip library into one zip file, and how to serve this file in HttpServletResponse of your servlet. This tutorial provides example of servlet running on Google App Engine for Java, and is dependent on Apache commons IO library, so you need to be familiar with adding jar files to your project, and you should know the basics of how servlet works (though it’s not required). I am using Eclipse Juno IDE with the App Engine plugin, and I advise you to use it too (it can really save you a lot of troubles). The servlet also expects the following files to be present in the war directory of your App Engine project. The source code is commented in almost pedantic manner, so everything should be clear, but if you don’t understand something, you are welcome to ask me in the comments section below. Also, if you are using Safari, don’t be surprised that the folder will be unzipped immediately upon download. Thank you so much for your solution! It is exactly was I looking for, mainly for the blobstore section! Exactly what I wanted! Thanks for this.